World economy – Freedom For Humanity! 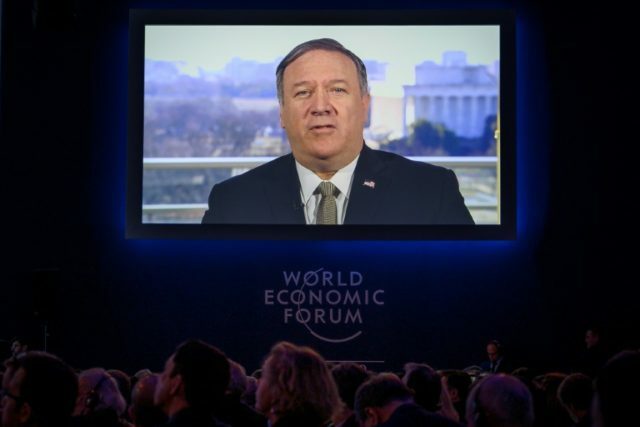 Pompeo enthusiastically defended President Donald Trump’s 2016 campaign slogan – “Make America Great Again” – as a philosophy that accelerated economic growth in the country and improved the lives of average Americans. He encouraged the gathering, including both world leaders and influential global businesspeople, to embrace “economic security” and reject the influences of international bodies far removed from the interests of the people. Posted on January 23, 2019 by TheLightHasWonPosted in Alternative NewsTagged China, Davos, Death of Globalism, Economic security, Financial, GeoPolitical News, National security, Nations matter, News, Political, Trump administration, USA, World Economic Forum, World economy. Australian housing market is falling apart. The US housing market continues to decline, the people’s economy is deteriorating at lightning speed. The recovery never it happened and Trump is racing against time. The elite meet in Davos and they starting to realize that they are trapped, their plan to cover up the greatest economic illusion has backfired. Pompeo says the winds are changing, prepare for the storm. The video of the Convington boys all started with a fake twitter account. Trump tweets about the incidence and says it shows how evil the fake news really is. Nathan Phillips is not a Vietnam veteran. The MSM is now pushing that making faces is racist or in 1984 terms, facecrime. Q warned that this day would come, that it would be clear to everyone who is the enemy of the people. Muellers investigation shows that he has no evidence. Trump is still planning on giving the SOTU address, it will probably be at another location. We know what the [DS] has planned so does Q and team. Posted on January 23, 2019 by TheLightHasWonPosted in Alternativa Nyheter, Finance - EconomyTagged Al Gore, Central Bankers, Central Banks, Corruption, Davos, Death of Globalism, Deep State, Economical News, Financial, Geopolitics, Gigantic Bubble, Global Economy, Global Warming Fraud, Globalism, Globalism is Dead, Globalists, IMF, Mainstream Media, MSM Deep State, MSM Fake News, Patriots, Political, Prepare for Change, QAnon, Robert Mueller, Secret News, the elite, The People are Rising Up, The People are Waking Up, Trump, US Government, USA, World Economic Forum, World economy. Posted on January 17, 2019 by TheLightHasWonPosted in Alternative NewsTagged A bright future, China, Economic agenda, Economy, Financial, India, New Bretton Woods System, President Trump, Russia, Support President Trump, United States, US Government, US Politics, USA, World economy. Don’t be confused by the incoming Democratic House of Representatives and all of the things the mad media says they will do to the President while paralyzing government for the next two years or worse. The spirit of 2016, the revolt in the American population which led to Donald Trump’s election, remains alive and very well within the American population. That is what LaRouche PAC found in our 2018 Campaign to Secure the Future, through our campaigns and our interactions with Americans on both coasts, throughout the Farm Belt, and in the Midwest. This remains true after billions of dollars have been spent in attempts to pacify the American rebels, cage or eliminate Donald Trump, and completely buy the Congress. It remains true after an angry and desperate media campaign that turned American icons—star athletes, most of Hollywood, and former leading political and media figures—into insane and frothing versions of their former selves, engaged 24 hours a day in attacking the American President. It remains true after the British and their allies from the former Obama White House directed a two-year coup against an American President and the people who voted for him, in which they attacked our country and fired the full propaganda and psychological warfare arsenal normally reserved for hostile regime change and small wars internationally. Posted on January 17, 2019 by TheLightHasWonPosted in Alternative NewsTagged China, Coup against President Trump, cultural renaissance, Defend Trump, Economic recovery, economic renaissance, Economy, Education, Financial system, Globalists, India, Japan, New Bretton Woods, President Trump, Russia, Science, Society, Trade, treaty, United States, US Economy, US Government, USA, World economy, World Financial System, World-wide economic renaissance. Trump bashes May again and in the process reveals that the BREXIT deals is for the central bankers and not for the people. Consumer confidence dips, savings rates decline, a recipe for a disaster. US home prices are leveling off and beginning to decline in many areas. WTO releases report that the world trade is slowing, but what they really mean is their controlled globalists trade is slowing. In the end the objective is to go after the entire globalist/central bank system. In the end the objective is to go after the entire globalist/central bank system. Congress is reviewing to see if Jack Dorsey lied about banning on Twitter. Trump continues to tweet about Mueller and Brennan responds, the DS is panicking and you can smell the fear. Mueller is being investigated. Clinton has to testify under oath about her email system. Military Investigation Services along with State and Federal Law Enforcement Agencies to Hold Press Conference. Obama might be the redacted name on the FISA warrants. MSM messes up when reporting about the caravans. Ukrainians arrests on ships say they were told to provoke Russia. No bombers flying over NK anymore. Place holders in place, prisons ready, fear, pain coming. Posted on November 28, 2018 November 28, 2018 by TheLightHasWonPosted in Alternative News, Finance - EconomyTagged Brexit, Caravans, Central Bank, Central Banks, Central Banksters, Economical News, Economy, EU, Europe, FED, Financial, FISA, Geopolitics, Global Economy, Globalists, Hillary Clinton, Mainstream Media, Monetary System, North Korea, Obama, Political, Prisons Ready, QAnon, Russia, Secret News, Trump, UK, Ukraine Crisis, US Government, USA, World, World economy.